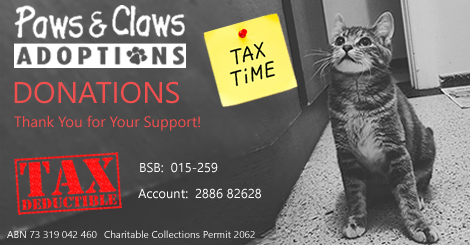 It is the 30th of June today which means its just about your last chance to make a fully tax deductible donation to help Paws & Claws Adoptions continue to care for and re-home cats and dogs in need. Remember you can always buy that laptop next year! Thank you so much for any amount you can afford. It makes such a difference in the lives of our animals.